I’ve been wanting to have a hay feeder built for the horses and took advantage of the good weather, as well as hubby’s recovery, to have him whip this up. The grid is a 2′ x 4′ grid with 2″ x 2″ openings from a Fixture store (they sell fixtures to retail shops for display; this one was about $15) and scrap wood, as well as extra hooks we had laying about from a former project. The bottom (wood section in below photo) is vented for hay to fall out and not get all stuck. After hanging, I think the angle needs to be more extreme so the hay will fall more forward against the grid. Currently the top opening is 12″ and the bottom is 8″ from front to back; we will probably reduce the bottom to 5″ (edited to add that we got that done on Sunday). Z decided right off that we made it for her. She is reaching over the new partition panel in the run-in shed to get a bite (BTW I’ve since raised that partition another 6 inches higher). BTW the reason the stall partition is in boards and not a solid sheet of plywood is because if a horse kicks through it’s cheaper to replace one board, rather then the entire sheet. The bottom plank is treated for outdoor use since it has contact with the ground. In the next photo you can see how it is cut to adjust for the slope of the floor (slope allows drainage). 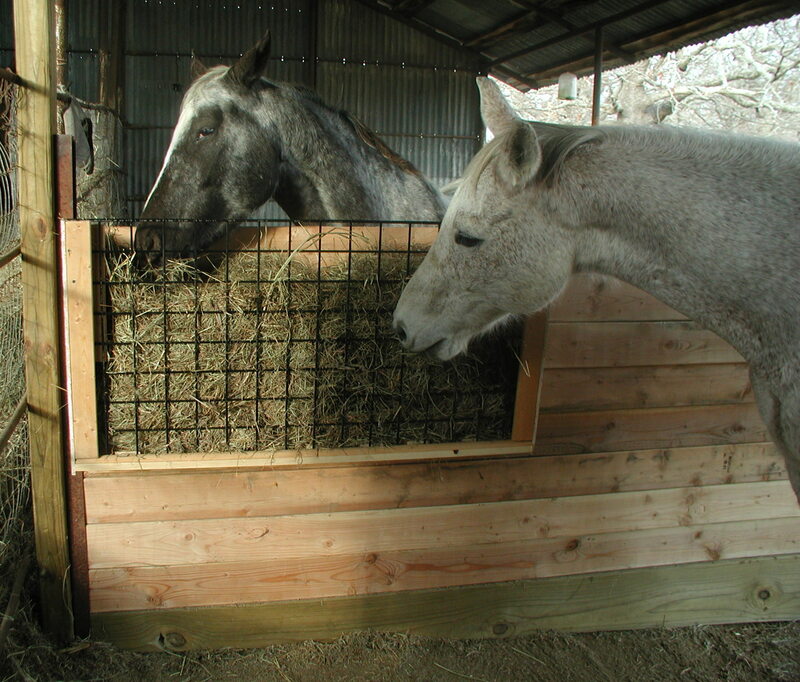 A 2×4 is attached at the bottom of the feeder and is nailed into the wall to prevent the horses from moving it about. A screw is put in at the top, front facing to prevent the grid from moving about. T-man took some convincing about the new feeeder! This is not a slow feeder – though I started with the thought it would be but we don’t have the ability to latch the top and leave it easy for the help to put in hay just by throwing it over w/o entering the stall. Right now I’m hoping it will slow him down with the smaller grid and provide him time to “graze” with smaller bites through the day. Normally, I’d feed on the ground but he was soiling far too much hay and it was running up my bill big time. I hope this is a solution that can work for us all. This entry was posted in Barn Design, hay & feed and tagged photos. Bookmark the permalink. That’s a nice smart piece of work – well done. Thanks J! We will be building two more at the end of the month for the mares. We made some changes to it today (as mentioned in the post) and T-man was very concerned when we TOOK DOWN THE FEEDER! but was relieved to see that it got re-installed with a new batch of hay. Z is convinced that is HER feeder, but can’t quite access it as well now that we’ve raised the wall 6″.